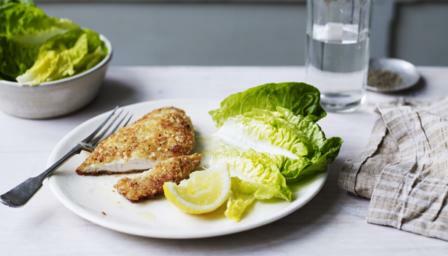 As if breaded chicken wasn’t delicious enough, James Martin adds chopped nuts, parmesan, thyme and lemon zest to the breadcrumbs. Put the chicken between two pieces of greaseproof paper and flatten using a rolling pin until about 1cm thick. Put the hazelnuts, parmesan, lemon zest and thyme into a food processor and blend to fine crumbs. Add the breadcrumbs and pulse quickly to just break up the crumbs, then tip out onto a plate. Scatter the flour onto a plate and season with salt and black pepper. Dust the chicken in the flour. Put the beaten eggs in a bowl. Dip the chicken into the egg, then into the hazelnut breadcrumbs, making sure to coat each side thoroughly. Heat the butter in a large frying pan, add the chicken breasts and fry until golden-brown - about five minutes on each side - basting with the butter as you go. Drain onto kitchen paper and then finish with a little more parmesan cheese. To serve, lay the chicken escalope on each plate and drizzle over all the remaining butter in the frying pan, then finish with a squeeze of lemon juice. Pile the salad leaves alongside with a wedge of lemon.